A 2,000 tonne capacity Zoomlion QAY2000 all terrain crane has completed overload testing on the testing ground at the Chinese manufacturer’s Quantang Industrial Park. In late October a test was carried out giving a load moment of 6,000 tonne-metres, the manufacturer said. In November, another 750 tonnes was added to the test load, increasing the load moment to 7,500 tonne-metres, the manufacturer said. The 9-axle all terrain crane, which has an additional three axle auxiliary drive unit, weighs 325 tonnes. 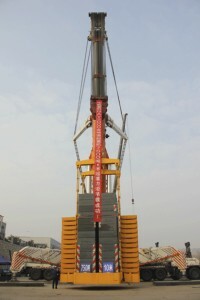 It was first shown at the Bauma China exhibition at the end of 2012.